IHRD was established in 1987, for the development of students in the field of engineering and related areas. It aims to provide high standard education and training to the students consistently. IHRD established nine engineering colleges, eight model polytechnic institutions, forty two colleges of applied science, two regional centers, two model finishing school, nine extension/study centers, two skill development centers and twenty one technical higher secondary schools in Kerala. These institutions have excellent class infrastructure, advanced research facilities and experienced and dedicated faculties. These institutions are one of the highly reputed institutions in South India. The government of Kerala has approved IHRD as Total Solution Provider(TSP) for computerization of Government departments. IHRD is guided and governed by body comprising ex-government members. The Honorable Minister of Education, Kerala state is the chairman of the governing body and executive committee. The chief secretary to the government of Kerala is the vice chairman of the governing body while the principal secretary, higher education is the vice chairman of the executive committee. IHRD established CEC in the year 1993 as the second one among its nine engineering colleges. Within a short period of time, college create its presence in the field of technical horizon of the state. Located in Chengannur town in Alappuzha district, also known as 'Venice of the East' the college has got access to all means of transport, communication and lodging facilities. The institute is approved by the All India Council for Technical Education AICTE, New Delhi and affiliated to the Cochin University of Science and Technology(CUSAT). Government of India for the Technical Education Quality Improvement Program (TEQIP) selected the CEC among six engineering colleges in Kerala, when it was implemented for first time. The institution got prestigious Larry K Wilson award, International journal publications and other National/International recognition. The college has adequate number of experienced and qualified faculty. Unique in its structure, methods and goals, the college is strongly rooted in a philosophy of training and research that emphasizes the intimate relationship between knowledge and its application and seeks to promote the creation of an ideal society. Department of Science and Technology (DST) has allocated projects under fund for improvement of S&T infrastructure in Higher Educational Institutions(FIST)scheme in last year. 'AICTE' also has provided funds under Modernization and Removal of Obsolescence(MODROBS)scheme for modernization of various labs, library and college buildings. Former students are working in reputed leading companies and research institutions in India and abroad. Well established infrastructural facilities, high academic standards, encouragement in co-curricular and extracurricular activities and discipline among students put forefront the CEC. 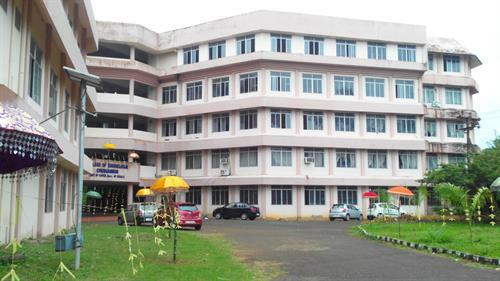 Among the institutions under the Cochin university of science and technology, College of Engineering Chengannur came out as the best performing institute in the B.tech examination for the first appearance in 2009, 2010 and 2011 with the highest pass percentage. The department was established in 1993 with an intake of 120 seats. Identification of India as a potential source of Computer professionals and keeping in mind the employment potential in this sector, the computer science department is shaping young outstanding engineers who are academically strong and can adapt well to the newly introduced systems and methods. Faculty members and supporting staff with rich experience are appointed in the department. The department has well equipped laboratory with state of the art hardware and software facilities. The main software facilities include database servers from Oracle, design software's, windows server class operating systems. Hardware facilities include rack mountable servers, laptops, higher end desktop computer systems etc. Electronics and Communication Engineering was established in 1993 and offers 120 seats. The main aim is to provide skill-based education and to produce competent and eminent engineers. 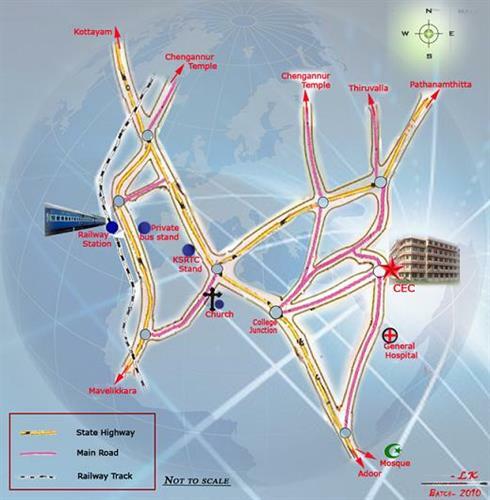 The department has good infrastructure facilities for system prototyping, high speed internet connectivity, in circuit emulators, function generators, microwave test bench, spectrum analyzer, digitize, virtual instrumentation hardware. Software facilities include development tools, multi-user license of lab view,cad star etc. The faculty always encourages students for paper presentation and other inter and intra state competitions. Various training programmes and seminars are organized for keeping the students and staff up to date in the field of their specialization. It is the only one of its kind in the University of Cochin and latest addition to the Institution in the academic year 2011 -2012. It was established in 2012 and is under the electronics department. The maximum intake of electronics and instrumentation is 60. The staff and management of CEC gives much importance to this department since it is in the 'incubation period'. The faculty always work with much effort to keep in pace with the ever changing control and Instrumentation scenario. The department has very good infrastructure facilities. The students are also given exposure to the industrial environment through industrial visits and industrial training. The students of the Department actively take part in curricular, co-curricular and extra-curricular activities. The department was established in 2009. It offers B tech in Electrical and Electronics Engineering from Cochin university with an intake of 120 students. The faculty always take the initiative for the development of the department by upgrading and modernizing the laboratory facilities, organizing seminars and conferences, providing excellent facilities for learning, research and development and consultancy works. As a result, now the department has got well equipped laboratories. Also periodical workshops, industrial visits and guest lectures are being organised for the benefit of both the students and the faculty.